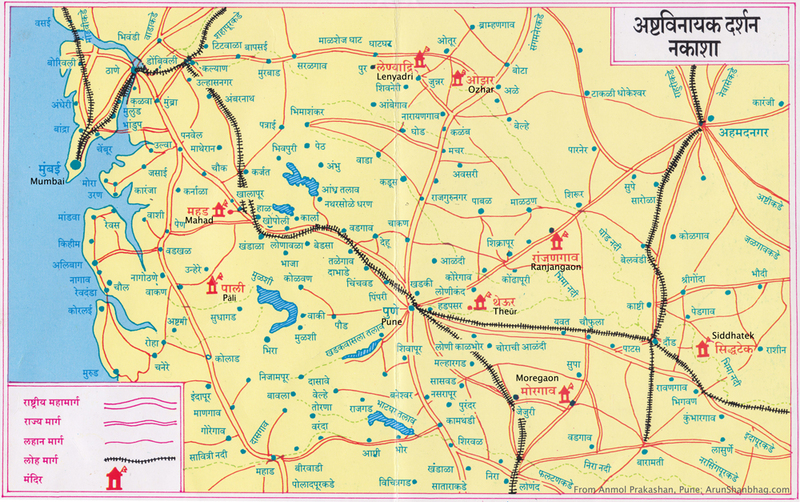 In the Indian state of Maharashtra, a tīrth yātra (pilgrimage) to visit eight ancient temples to Gaṇeśa (Aśṭa Vināyak) is mentioned in the puranas and considered very sacred. These eight temples, each with exquisitely beautiful Gaṇeśa murtīs, are in tiny villages, scattered around the mountainous terrain between Mumbai and Pune. After much procrastination, last February we were called on this short, beautiful and spiritually uplifting tīrth yātrā. We engaged with a small, local agency (Ajinkya Tours) in Dadar, Mumbai and with Meera in tow, embarked on this 3 day Aśṭa Vināyak yātrā. The tour was very inexpensive and included luxury bus travel from Dadar, freshly cooked vegetarian food and basic accommodations for two nights. Loved so many aspects of the organization. Since this was considered a “basic” tour, we did NOT have any spoiled brats or loud-mouthed phoren-return, NRI types. The bus was comfortable, but the journey through rural Maharashtra with bad roads, made it a bit tiring. Meera did not complain once during the 3-days and instantly made friends with everyone on the bus. The tour operators made arrangements at a few roadside eating places along the way, and we got simple, freshly prepared, delicious breakfast (upma, kichidi, idlis etc. ), thali lunch and dinner. We also got to experience the bucolic rural Maharashtra. The rooms were very basic, which mattered less as we got back to our rooms around 10:00 pm, and needed to be up before 5 am for bed-tea and out. The bus picked us up near Plaza Cinema, Dadar around 6 am on a Friday morning and after the tour, dropped us off near Sion circle around 8 pm on Sunday. Overall, a very exciting and busy weekend. Meera had a wonderful time and we got to see these beautiful temples. Verily, he does not reside in fancy palaces, but in tiny simple temples scattered on dusty plains. I have provided more notes in the captions of the pics. If you have gone on a asta vinayak yatra, I would love to hear your thoughts. Thank you for such an amazing write up. You are very blessed to have experienced such an amazing Ganesh journey. Thank you for sharing the blessings with us. After much procrastination, we were called, that itself was such a blessing. Glad I could inspire others to heed the call. Wow..this is nostalgic, we went to ashtavinayak exactly a year ago when we visited India!! Since my kid was only 14 months old, we hired a innova and camped out at different hotels on the way on the two nights. I had really liked the bus tour we had done with my parents and brother 7 yrs ago. Very nice post, brings back good memories. Yes, Innova is the way to go. Recently we did exactly that and went to Nasik, Shirdi, etc. But, traveling with 50 others on a bus for the Asta Vinayak was a very different experience, but equally enjoyable. Glad you had a wonderful trip. Hope you are planning and going on more trips. 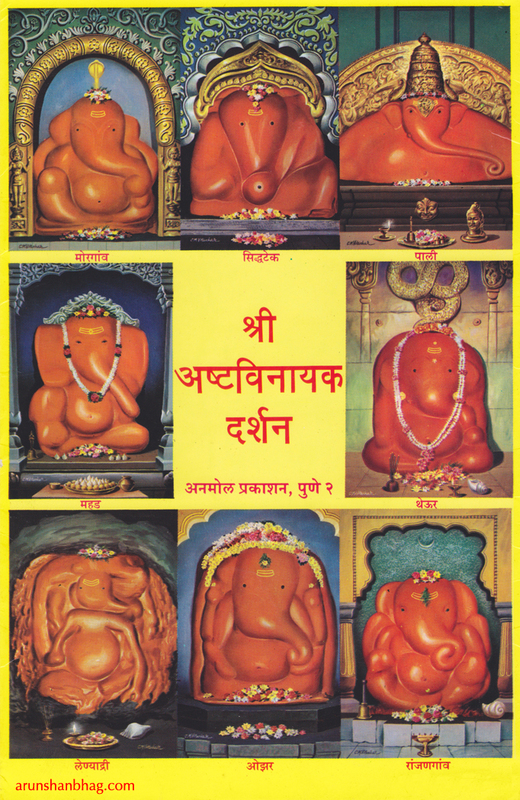 Thanks a lot arun bhau for sharing such information and getting us closer to our ladke daivat ganpati. Thank you Shweta for your kind comment. I think everyone should go on this yatra and not only get Ganapati’s grace, but also see the real bharat. Thanks for posting this, Arun! I think I have been to 4 out of 8 long long time ago before there were any lines. Thank you Parag, It was definitely an interesting trip and surprisingly so inexpensive and easy to do. Yes, the lines on the weekend are bad as ALL the tours essentially do the same sequence and same days. So if you go off-tours it will likely be easiest. Hope to go again on this tour. Meera grows prettier with every post. Thank you Les; She’s certainly a handful, keeping us on our toes she is.